The Guild of Educators was founded in 2001. Susan was admitted in 2004 while it was still in its early stages of development. She became a trustee of the newly-founded Charitable Trust in 2005 and was its Chairman from 2006-2017. 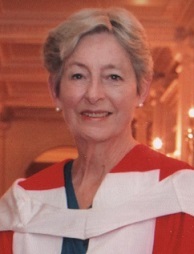 In this role, she played a major part in leading the fund-raising required to be eligible to apply for Company without Livery (achieved in 2009) and full Livery status (achieved in 2013) whilst, in addition, working with the trustees and external partners to develop the Educators’ Trust charitable activities. Susan was elected Lower Warden of the Company in 2014/15 and progressed to Master 2017/18. Susan has had a professional career in education, training, and economic development. Degree in French from University of Exeter. Post-Graduate Certificate in Education from Goldsmiths’ College, London. First job in 1965 as a French teacher. In early 1970s, demands of a young family prompted a move into adult and community education. Served as Vice Principal of Barking and Dagenham Adult College; Divisional Principal for Adult and Community Education in Kent; Vice Principal of Tower Hamlets Institute; then Principal of MorleyCollege in Lambeth. Returned to secondary education in late 1980s as Chief Executive of the City Technology Colleges Trust, setting up new schools with private sector sponsorship across the country in mainly inner-city areas. Appointed Chief Executive of the London East Training and Enterprise Council in 1993 – vocational education, employment training, workplace training, business development and support, regeneration programmes across east London. 1998- awarded the OBE for services to business support in London. 1994 -awarded Honorary Membership of the City and Guilds of London Institute (CGLI) for contribution in technical and vocational education and training. 2014 – awarded Fellowship of CGLI. Served as a Magistrate in Barking and Dagenham for 14 years culminating in election as Chairman of the Bench. Since retirement in 2002, has held various non-executive director and trustee roles. Currently non-executive chairman of a training company and trustee of a charity supporting older people.